Simply put, maritime transportation companies are leaving money on the table. In spite of all the endemic errors related to traditional noon reporting, many companies still rely on it as the fundamental building block on which so many important decisions are made. The reduced visibility into operational execution results in wasted fuel and money. The long-term implication for each vessel is even worse - lowering charter rates and creating less valuable assets. Luckily, we are at an important inflection point, one that is characterized by cost-effective digitalization becoming accessible for owner-operators in maritime. At Nautilus Labs, we have built and are continuously improving a tool that allows globally distributed teams to collaborate around the key data and insights that matter to each shipping business. The insights surfaced by Nautilus Platform have already enabled our clients to reduce operational fuel waste by 3%. A granular real-time understanding of vessel speed and consumption has allowed our clients to negotiate increased day rates by 1%. This ROI on Nautilus Platform is substantial - and it’s just the beginning. 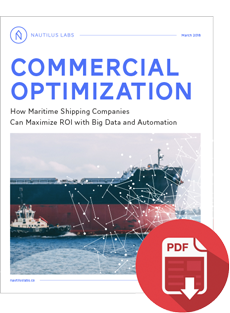 To read more about the potential for commercial optimization in maritime, fill out the form below and then click on the download button to download our case study. Nautilus is building artificial intelligence to advance the efficiency of ocean commerce. We deliver technology to help shipping companies minimize fuel consumption, maximize operational efficiency, and optimize fleet performance. By arming ship owners and operators with real-time predictive decision support, Nautilus is reducing greenhouse gas emissions and making global trade sustainable. To learn more, click here.